Very Good. A book of 175 fast foolproof recipes for doctoring up ordinary cake mixes to create extraordinary desserts. They range from toasted coconut sour cream cake to Charleston poppy seed cake. Trade paperback (US). Glued binding. 454 p. Contains: Illustrations. Good. A book of 175 fast foolproof recipes for doctoring up ordinary cake mixes to create extraordinary desserts. They range from toasted coconut sour cream cake to Charleston poppy seed cake. Trade paperback (US). Glued binding. 454 p. Contains: Illustrations. Very Good. 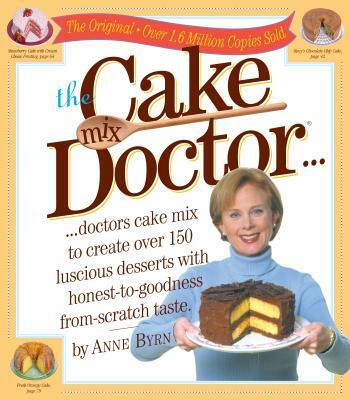 The Cake Mix Doctor by Byrn, Anne. Contains: Illustrations. Good. The Cake Mix Doctor by Byrn, Anne. Contains: Illustrations. I like this book,i had one gave this to my daughter! Okay, a cake mix is not something you can get really excited about but this is also a reference book for those who don't have the time or experience to do it from scratch. You can make most anything from these simple how-to recipes. Full of baking and decorating tips, its a very practical book. I would recommend it for first time cake bakers as well as a reference for mid-level bakers. I was impressed with the size and content of this cookbook. It was better than I had imagined. It also had many unique ideas for blending frig and pantry items with boxed cake mixes, which made for some spectacular creations. It was a great find. Haven't used it yet but have used one of the other of the 4 I ordered and loved the results. I am sure this will be a favorite as soon as there is a need. Once you start using this book it will be one of your favorites.